Please confirm the switch is under “on” status so that the light could be charged normally and auto lights on at night. If the ground is too hard, do not twist or hammer it with force. Try to soften the ground with water and then insert into the ground. The latest technology for beautiful, high-tech landscaping would be these solar powered in-ground Lights. During the daytime, they are retracted, and absorbing solar energy. At dusk, they literally pop up and light up, giving you lights along a pathway, driveway, deck or dock that aren’t in your way during the day.Includes installation hardware, completely wireless. Powered by a lithium ion rechargeable battery that’s solar powered – each light illuminates via 4 LEDs. Completely weather resistant. Each light works independently. Notes: Please be kinldy noted that as a solar powered product, the working time is weather sensitive. 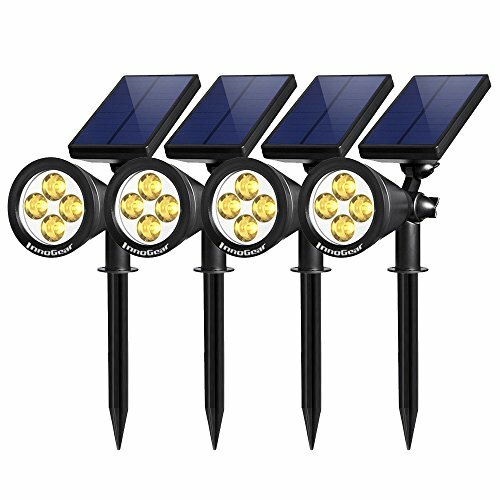 4 in 1: Package includes 4 solar lights with 2 installation options, stick into the ground / use included screws to mount on the wall. Warm White with Upgraded Brightness: Creates a welcome home feeling with warm color. Each solar path light has 4 x 50 lumen LEDs with total 200 lumen for clear brilliant illumination. Auto on at night / Auto off at sunrise: Switchable high/ low brightness working modes; Longer Working Time with 2200mAh 18650 lithium rechargeable battery. Adjustable Light and Solar Panel - IP65 waterproof and heatproof. Full range adjustable light angle to illuminate perfect spot and adjustable solar panel angel for optimum sun exposure.